Many materials fall into the category of stainless steel alloys, including austenitic, martensitic, duplex, ferritic and other types of stainless steels. These are most easily NDT tested in both tubular form or in bar stock form (long constant cross section). Tubulars can be seamless or welded tubes. Further refinement can be drawn and ground surface. Sizes can range from those for hypodermic needles to >500mm diameter pipes for oil and gas transmission. Bars can be as rolled, peeled or drawn and surface improved. 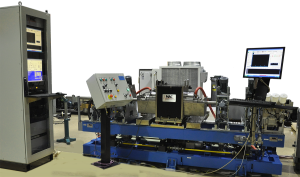 The two primary methods of testing / inspection are Eddy Current and Ultrasonic. Many producers of tube make products in house from various material grades. Many of the grades are called “Stainless”. These grades are often known or thought to be austenitic and therefore non-magnetic. Usually, this type of product will be tested using a magnetic saturation bias field which is applied to the normal eddy current type test coil. This is done because there is some part of the production process that causes local hardening of the material which creates some ferromagnetism. The ferromagnetism results in “noise” which compromises the eddy current test results. By saturating the material, permeability variations are evened out, making the material appear to the test system as though it is non-magnetic, which allows the normal eddy current test to be successfully applied. Many bars will have some surface seams that need to be detected. Seams are normally longitudinal in nature and the spinning EC probe method is the best technique to detect surface seams. Seams on the order of 0.15mm (0.006”) can be detected in as-drawn material. If the bars are surface improved, it is possible to detect more shallow seams because of the higher quality surface. Some seams and cracks that are present are not detected with surface eddy current testing if the bar surface is in compression due to the bar processing method. Many tube end use applications mandate that the tubes be ultrasonic tested. 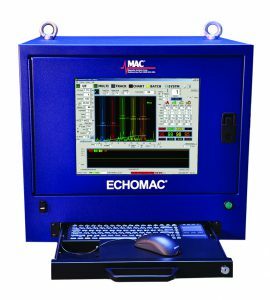 Heavy wall tubes can benefit from ultrasonic testing because the heavy wall configuration attenuates the capability of an Eddy Current test to detect conditions on the inside surface of the tube. Solid material can have internal discontinuities and inclusions from a variety of sources. The Ultrasonic method can detect small internal reflectors equivalent to any quality level of AMS-STD-2154. The material processing method and material quality strongly determines the possible inspection level. 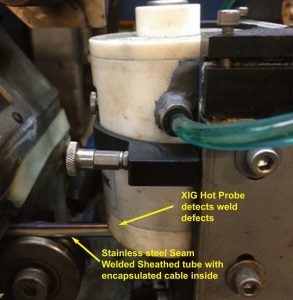 Stainless material with no magnetic properties can sometimes benefit from being tested with the shear ultrasonic method to detect shallow seams or subsurface defects or any seam depth for that matter. 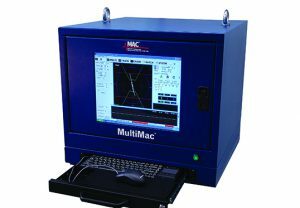 MAC supplies a wide variety of NDT equipment and complete test systems to handle the increasingly higher quality demands of the many quality driven world industries. 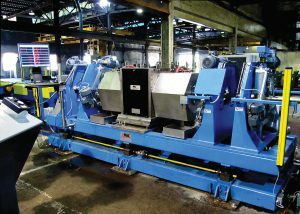 Many systems are provided as a combination eddy current and ultrasonic test system to take advantage of the strengths of the different testing technologies. MAC is uniquely positioned to supply both technologies in a cost effective configuration that minimizes size changeover time. 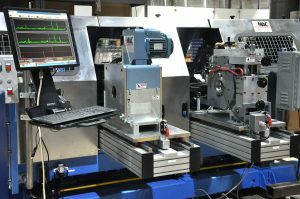 There are many possible test machine configurations. These can be linear product feed with encircling eddy current coil and/or rotary transducer (spinning transducers and spinning EC probes), helical feed spin the tube or bar or overhead gantry configuration (fixed position spinning product). 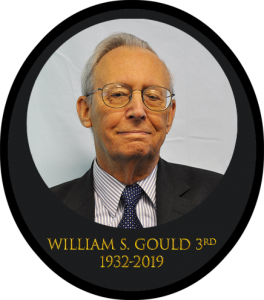 A Multicollector device can be supplied to collect all data from multiple test stations in an organized fashion to be stored in a query type database for intelligent storage and retrieval.